이 페이지는 현재 영어로 제공되지 않습니다. Tashi travelled from his Tibetan village, perched on the Himalayan mountains, to the city to attend Buddhist school. He left his wife and family behind and set about preparing himself to become a lama (Buddhist priest). While studying Tashi met a Christian man and started hearing the Gospel for the first time. He was confused about the different things he was learning about Buddhism and Christianity. He soon met a second Christian who told the same story as the first and Tashi decided that he needed to understand Christianity. He took a two month break from his studies to investigate the Gospel more seriously. Tashi put his faith in Jesus Christ and never returned to Buddhist school. He then volunteered to work in a Christian children's home. Tashi returned to his village and was keen to share his new discovery with them. The villagers knew that he was now a Christian and would not allow him to come home. So Tashi went back the city. 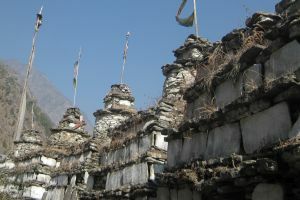 Some of the villagers were unable to keep their children and Tashi soon had four children living with him. It was at this point that GRN staff met Tashi. He was unable to support himself but was caring for these children. He was also going back to his village, taking clothes and medicine, and trying to take the Gospel as well - without success. In 2011 GRN entered into a partnership with the Bible Society of Australia. This allowed the GRN team to distribute large quantities of recordings and picture books. GRN had recordings in Tashi's own language. 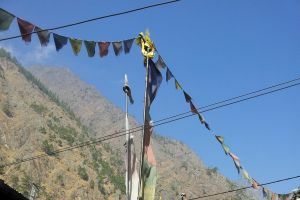 Tashi returned to his village with medicine, old clothes, and this time with GRN recordings in his village's own language along with picture books to illustrate the message. Hearing the good news in their own language, the villagers welcomed Tashi home and listened with great interest. It was the first time he had been welcomed back. The villagers gave him a place to stay. They were so keen to have their own Sabers and picture books that they traded eggs and chickens to get their own copy of the Gospel message from him. Tashi went back to his village soon afterwards with vegetable seeds, clothes, medicine, and more recordings and picture books. Donkeys were hired for the long and arduous trek along narrow mountain trails. Two donkeys lost their footing and fell off the trail - they and their loads were never seen again. They arrived in the village and were welcomed along with their cargo. People continued to hear the good news with great interest. Soon the chief lama realised that Tashi was bringing Christianity into his village. He was angry. Tashi, along with the message, were again banished. However, 11 young men wanted to learn more. 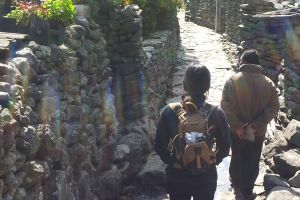 They left the village and met with Tashi in the city for two weeks of intensive instruction in the Gospel. At the end of the time, seven wanted to be baptised. When the day of the baptisms came a strike was called in the city. There was no way they could reach the church to be baptised. A bath was found, but it leaked, so plastic sheeting was found to line the tub. Finally all was ready and the seven young Tibetan men were baptised and the event was celebrated. The men went home. As they approached their village they were stopped and forbidden to enter. They called their GRN friend. He didn't know what to do and so they prayed. Tashi decided that he was going back to his village and if they killed him he would die. He set off on the journey. Two days from home he met the recently baptised men who accompanied him. When they arrived at the village, the chief lama was drunk. He pulled out his Gurkha knife (normal part of a man's clothing) and went to stab Tashi. As he swung the knife he fell off the cliff edge he was standing near. Tashi and the new Christians climbed down, rescued the drunken lama, dressed his wounds and carried him to his house. The lama's family was very impressed that they and not the other villagers came to his aid. When the chief lama came to and understood what had happened, his heart was softened. The recently baptised men were allowed to return to their families. The chief lama came to faith in Christ soon after this event and the entire village soon followed his lead. Today three Tibetan villages are Christian as a result of these events. The villagers are now taking the good news to a fourth village. A mission agency has helped the village construct a church building. The children's home where Tashi worked is now providing a safe place and education for more than twenty children in the city. Tashi died a year or so ago. Leaders had been prepared in these villages and so the church continues to grow. We at GRN give thanks to God for the part He has enabled us to play in these events. Praise the Lord.